Then the wind and high waves came, and the hungry seagulls took refuge on land waiting for better days. You want to know why the seagulls are in town? Look at this. 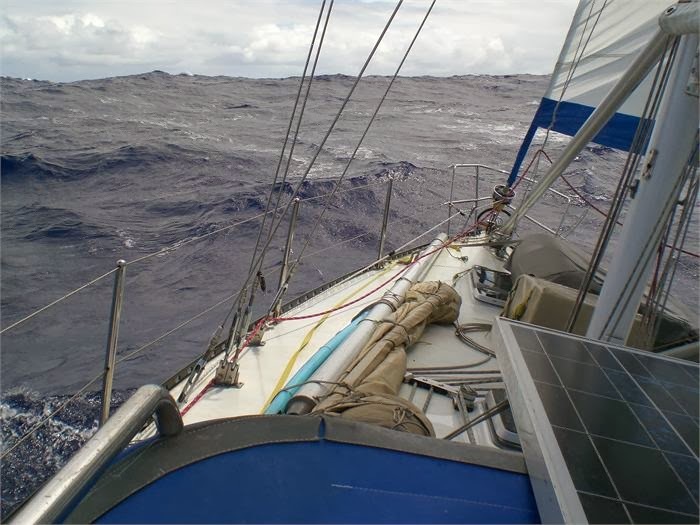 34-knot gusts today, reaching 42 knots on Tuesday along with 6.4 m [updated to 7.2 m] waves. That'll get us in the Christmas spirit. If you can't have snow, might as well have wind and frothy waves. There was no electricity at the marina when I arrived in the morning. I have a ton of translation work and was tempted to head back home. But then a thought struck me; why not work on my new Samsung LCD laptop and see how far the battery would go, or maybe even hook it up to the inverter - I do have a Rutland wind generator after all, and it was blowing hard. I got to work and the sweet Samsung just kept on going and going. When the power came back on before lunch, I still had lots of battery juice. So I've got the perfect laptop for next year's trip. And that's it. I worked, had lunch, walked around the marina, ran into Ryker and found out that the "Dream Boat" was not made in Poland. It's a boat made in Russia, of all places, and purchased in Spain. The crew is a French guy and an Oriental woman. Think about it: a Russian-made boat, bought by a French sailor in Spain with an Oriental woman aboard, docked in Peniche and going somewhere. Whooo, globalization is getting out of control. Yesterday I did some laundry, including the dinghy. One thing I really enjoy about the Peniche Marina is the transient dock. It's low season now, so naturally the transient dock is full of French boats. Are French sailors cheap or are they simply more adventurous? Another interesting aspect is that they have a tendency to keep to themselves. Maybe that's why they cruise off-season, to avoid the crowds. Who knows. Here's a boat, supposedly made in Poland, that is a complete contrast to mine. The cockpit is huge and inviting. The bow is thin and perfect for slicing through water. I bet it's fast, and I like it. Don't know how safe it would be in a storm, but you'd take your chances, wouldn't you? A partial hard dodger with roll-up side curtains, mainsheet control near the wheels, carbon mast...and an electric roller furler. On the other hand, the interior is probably equivalent to that of a 32 footer, but I wouldn't complain. On the other side to the pontoon there's an old, but nicely kept and sturdy-looking, 22 footer with a tiny cockpit. It also sailed all the way from France and will probably end up at some exotic port. The trip likely took three times as long but, as one sailor once said, "when I'm on my boat, I'm already where I want to be." As I stood on the pontoon daydreaming about owning such a boat - the larger one, that is - I got a phone call informing me that I had been emailed work. Work, what a dreadful four-letter word. Dragged my feet back to Jakatar with its small cockpit and huge interior. Obviously you can't have both, can you? I can't decide if my lunch looks appetizing or revolting. It's turkey beef, baked eggplant, zucchini slices, black beans, rice and the white droopy things on top that look like fishing bait are pieces of onion. I forgot to buy wine, ran out of tea and thus had a cup of water. In the morning I decided to give my electronics some exercise to burn up moisture. 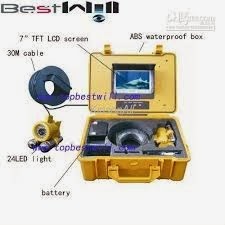 My inventory consists of 1 fixed and one handheld VHF, hydraulic auto pilot, Magellan chartplotter, computer chartplotter, handheld GPS, depth sounder and an electronic Ritchie compass. That's it. I also switched on the running lights. Here's my Toshiba laptop I bought about 15 years ago displaying the Port of Peniche. It stopped working once, after having sat idle at home for a long time while I crossed the Atlantic. Somebody told me to whack it hard. I did, and it started working again. Apparently, the hard drive may stick when left unused for long periods. Every photograph I took of it showed that white spot reflecting the flash. There's a saying that goes something like this: Geniuses figure things out fast; Wise individuals learn from other people's mistakes; Ordinary people learn from their own mistakes; Fools never learn anything. Considering that most boating accidents are caused by human error, I'd like to offer my contribution to making sailors less foolish, including me. 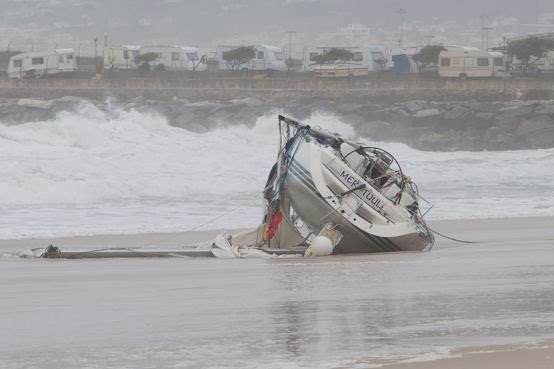 Boating accident in April 2013 at Figueira da Foz Portugal, as described in another post. I hope to gradually build a list of common boating accidents and my opinion on how to avoid them. Note the yellow jackline. Talk about false security. This boat is owned by salty world cruisers by the way. You have a dodger in the way. Then rig a jackline from the bow to the dodger and use some other means to clip on while getting past the dodger to the main line. If you fall overboard or get locked in the head compartment (this actually happened to somebody before) you can call for help. I'm the only person I know that does this. It may sound like overkill, and maybe it is. All I know is that I've never had a car accident, but I still buckle up whenever I get into a car, and you probably do too. If you do it right, a direct deposit is not really that dangerous. But you know how it is, men aren't very smart below their waist and tend to do it wrong. You figure it out. On a windy day, drying your fingers on your pants afterward is also bad form. 3. Don't sail close to shore near windward capes. I know of one sailboat that sank at Cabo Raso, Portugal, because of this. It would seem logical to think that if the wind is blowing hard from land there's no danger in sailing close to shore. Wrong. For example, on a summer afternoon, offshore winds at some of Portugal's capes and along the coast of Algarve can quickly transform a leisurely sail into a wild everything-on-the-floor storm-like struggle. If you have all sail up, you'll need to reef or drop sail, fast. To reef or drop sail, you must turn into the wind and maintain a decent speed to keep your nose into the wind . If you're 1 mile from shore and heading for it at 5 knots, struggling with the sails - while everybody aboard is shouting orders and opinions - you'll run aground in about 12 minutes. If you abort the operation your sails will pay the price. Places where this is likely to happen on a summer afternoon, ranked by ferocity. Courtesy of the newspaper "Jornal das Caldas." This is incredible. The boat is now on the hard in Peniche and, I've been told, for sale. 4. Tie off your anchor while sailing, untie it before you enter a port/bay. 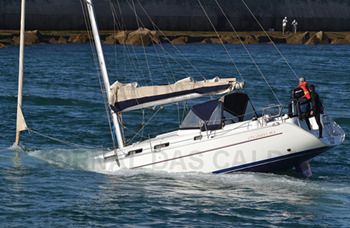 Last year, the sailboat shown above was heading north for Peniche in rough conditions and was nearly sunk. The unsecured anchor came loose and banged a hole in the hull. By looking at the picture above, it's hard to believe that the lifeboat was able to tow it into port. The boat is still in Peniche on the hard and for sale, I believe. 5. Boom preventers are like seat belts - keep them on even close to home. I nearly always rig preventers even if I'll be sailing close hauled. If the wind direction changes, if you change your route because of an obstacle, if you turn back for any reason - meaning you'll then be sailing downwind, etc. - will you set up the preventers on the go? I doubt it. Make sure the preventer line ends go back to a winch and not directly to a cleat. I don't want to scare you, but jibing booms have killed more than a few sailors and seriously injured many more. 6. Repeat after me, "I will press the MOB (man overboard button) when anybody falls overboard." Fortunately, nobody has fallen from Jakatar yet. However, I know how easy it is to lose something during an "exciting moment" because I simply forgot to press the MOB button. I lost my new Rocna anchor and chain in the bay of Sesimbra because of this oversight. Bringing in or releasing the genoa sheet during a tack may seem harmless enough, but you'd be surprised how easily an inexperienced person can get their hands trapped between the winch and sheet line. Once when anchoring at Berlenga Island, I slowly explained to three reasonably intelligent men how to drop the anchor. Right, easy, no problem. I turned the boat into the wind until it came to a near stop in 20 meters of water (deep anchorage) and shouted "drop it." The chain clattered over the drum for and then stopped too early to reach the bottom. What's the problem?" I asked. No answer, just three men stooping over the bow roller excitedly doing something difficult that I couldn't see. When I walked forward, I found that they had cleated the chain to the starboard docking cleat with a knot. It took some time to undo the knot under the strain of the heavy anchor and chain. I know this is hard to believe, but it's true. To be continued, if I don't suffer a boating accident in the meanwhile. I finally bought my fishing tackle at Decathlon - a collapsible pole, reel, landing net, lines, lures, hooks, floats, sinkers and a pail - all for about 80 euros. Top quality material, as you can guess from the price. It took me a whole afternoon to spool the line onto the reel. Tip number one: when spooling the line, the reel must be under the pole and turned with your left hand. My first catch was our cat that walked into my office and into a mess of line on the floor. Before I realized it, it was all tangled, started going nuts and I had my first big game adventure before I even left the house. Next, I practiced my casting technique in the yard. On my first try the damn sinker went right over the fence and into the neighbor's yard, scaring the crap out of her dogs. Then I overturned some decorative rocks and caught half a dozen worms. That's it, I was ready for some action. My collapsible pole and bucket at Paimogo beach. Some things in life are downright puzzling. For example, when I opened my pack of hooks I couldn't believe what I was seeing - they had no holes for tying the line, merely a flattened head. But I'm sure there's some logic to it. Plan B: I used a small lure and put a worm on its hook as an added attraction. It looked like a small fish with a long poo coming out of its arse. I tried casting from different rocky outcrops, but nothing. The tide was low so that didn't help either. Finally, I lost my sinker and lure on a rock and gave up. Instead of catching fish, I got a good look at what lurks in these rocky bottoms. While I was playing with my pole, a young diver speared two monster conger fish. The real test will come when I go fishing on the boat, and I have some real good (expensive) lures for that. This was once an interesting fish restaurant. The local authorities closed it down because the cliff behind it will come crashing down sooner or later. It's been about 15 years and we're still waiting for the big event. Anchored in Alvor - July 2013. This summer I was fortunate to be anchored in Alvor, among other places. I'm now back to "real" life. I tell you, real life wears thin pretty fast when your heart is in Alvor, Culatra, Sagres - anywhere with a good anchorage, palm trees and cafés. "Real" life is what most of us do nearly all the time - as opposed to what we dream of doing. Once you've indulged in what really makes you come alive, real life can get a bit tedious. You see, although I had an enjoyable day on the boat, I don't really have anything exciting to write about. 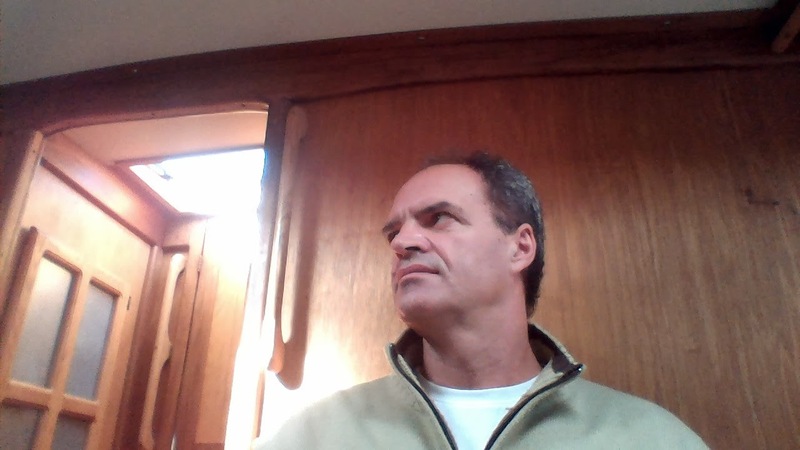 I'm just your average Horatio, a sailboat owner, a translator, a holiday home renter and occasional small-time adventurer living in Portugal. Well, in a worst case scenario I'll have a few laughs reading this narcissistic crap when I'm 80. Really, I'm serious. But when you have nothing exciting to say, you borrow somebody else's stuff direct from Youtube. This is what I should have been doing when I was 24 instead of founding a greenhouse construction company and a greenhouse farm in Portugal immediately after I realized I'd never be a writer (which I knew all along - the writing delusion was merely a good excuse to delay Real Life). Searching for something to say. As I worked on a small translation after lunch, I photographed myself with my new Samsung Laptop. Since I'm not exactly the handsomest dude in town, less pixels work to my advantage. I'd rather be here, one of the most fun sailing adventures without an engine on a friend's boat. Motoring against a light breeze just before the engine died. Enough philosophizing and back to real life! I arrived at the marina at 8:30 and performed my ritual: checked the battery charge with a cheap digital voltmeter and looked into the bilges for rainwater that sneaks in through the emergency tiller pipe, the anchor chain hawsepipe and the mast step. The dehumidifier, timed to run about 12 hours per day, decreased relative humidity to 70% from the usual 85%. Not as good as I had hoped; I changed the timer to 14 hours per day. Next, I managed to finish the job of replacing the heat exchanger zinc. I also re-arranged the fenders and added another dock line in preparation for winter. Then I had lunch. Another ritual is my after-lunch walk. It was threatening to rain so I walked around the marina, ran into Ryker, talked about boat stuff, and then returned to Jakatar to find a small urgent translation and a larger document for next Tuesday waiting in my mailbox. Now that wasn't so painful was it? How was your day in real life? The sun has suddenly vanished, and I'm not exactly thrilled about it. Winter's first grey days reminded me of this song performed by Joe Cocker. I'd rather be on Jakatar Motor sailing north than sitting in the boat listening to rain and wind. "Strong-willed individuals are not affected by the weather," the experts say. Send the experts to Alaska for a couple of years and then ask them what they think! Although Jakatar is of closed-cell airex sandwich construction above the water line - which makes it condensation-free - I still went out and bought a dehumidifier/heater. There's nothing like a cozy, warm bone-dry interior. Sorry about the picture quality. It's dull, drab, grey...like somebody's basement. Look at the flag. It was nearly perfect last week. Lucky the police didn't fine me for insulting Portugal's symbol of glory. Kinda of looks like what's happening to my hairline. The entrance is rough and murky. This heavy trawler was dancing in the swell before it entered the port. See the ketch in the middle. It's on the mooring I sold to Antonio and consists of three 1-ton concrete blocks placed in a triangle joined by about 500 kg of ship's chain. The blocks are probably buried in the mud by now. And, yes, I really do feel like an idiot - you could moor an oil tanker to that. Funny thing too - when I sold the mooring I was the only boat out there. What's not so funny is that I sold my bullet-proof mooring, and the marina is falling apart. We may be looking at a change of scenery in the not too distant future. Hey, when you're alive and kicking, anything can happen. This week I went to my floating office on Wednesday instead of Thursday; blame it on a dentist appointment. Instead of the fabulous hybrid sailboat (featured in my last post), I found this beauty parked across from me. I don't care what you say, this boat has style...well, maybe more so 20 years ago. It's a classic that sails, has a big anchor, and plenty or deck space for surfboards and a dinghy. Most of all....most of all, I like the way it stands out. Additionally, it makes you want to see the adventurous crew, which surely includes at least one gorgeous woman wearing shorts and a loose blouse. Behind it, there is a no-name cat. I bet it's better than it looks. It's definitively worth way much more than the other boat, but somehow I'm not interested in the crew that I never saw by the way. To think of it, the gorgeous woman is probably on this boat. The Rip Curl world surfing championship is taking place 500 m from here at the Supertubos beach, and I'm too busy translating to have a look.